There is no fixed plan on how the volunteers should conduct the lessons, but these activities have been thought of by the volunteers while we were planning for next semester’s lesson plans. You may choose which week you want to use the activities for, but there are certain activities that have a preferable timing. This theme would last for three weeks, although volunteers can choose to shift it around. - At the start of the lesson for that week, volunteers bring in mini cupcakes and ask the children to guess who made them. (The answer is baker.) This is to give them a clue about our theme. Volunteers can make the children try and guess the theme too. - After reading (and dramatising) the big book, the children will make baker’s hats. Volunteers can choose to find the template online or attempt to make it themselves. They can also choose if the children can colour their hats. - The cupcakes that were shown to the children at the start of the lesson will be given to the children as snacks. - Logistics: Paper and colour pencils for making hats, bought cupcakes. - After small book reading, the children will stay in their small groups and each group will be given a picture (of an occupation) which has been cut up. They would have to solve the puzzle together with the people in their groups to obtain the original picture. (Note that the original pictures have to be pasted on the walls so that it is not too difficult for the children. Volunteers just have to assist the children and make sure that no one gets hurt.) Then, the puzzle pieces from all the groups will be mixed and put together in the middle of the room. The children will still stay with their groups but one child from each group will go up at any one time to get her/his own group’s puzzle piece (only one at a time). The group that manages to complete their picture first wins. (Volunteers have to be especially careful to make sure that the children don’t rush out all at one go, because it will become very messy and accidents might happen.) Note: Each group’s picture’s borders will be outlined with a different colour so that the children can identify their own puzzle pieces more easily. - Logistics: Pictures of different occupations (with colour). - Children are told to pick a piece of paper with a picture of an occupation, for example doctor or fireman (probably from a box). They are then seperated into groups by gathering together with other children who got the same picture as them. They will act out the occupation that they picked out, and the children from the other groups will have to guess what is their occupation. 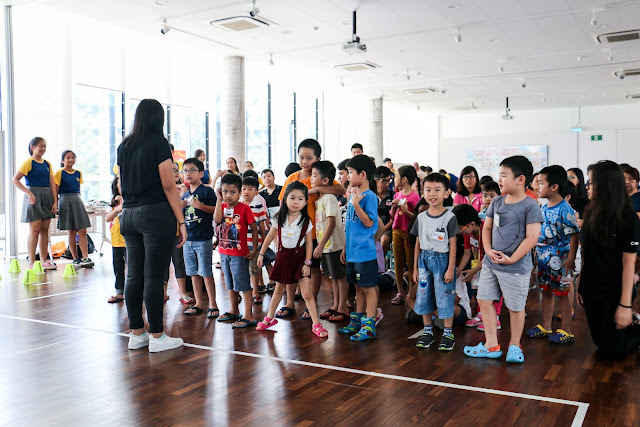 Note: The volunteers have to actively assist when the children are looking for their groups so as to not make it too easy for other children to guess each other’s occupations. Volunteers may also be assigned to groups so that they can assist the children in acting. - Logistics: Pictures of occupations (with colour). - This activity is similar to Act It Guess It, except that it is done individually. This activity should preferably be done the week after Act It Guess It or during the last week so that the children would already have been familiar with the theme and would be less afraid to go up and act. Note: Volunteers to assist. - The children will be given time to draw out the occupation that they want to be when they grow up. This is also preferably done during the last week so that the children have an idea of what they want to be. - Logistics: Paper and colouring materials. - This is a back up game that can be done when there is nothing else to do or when volunteers have to entertain children during toilet breaks.